An anomaly has come to light which I hope you will be able to help resolve. Under the previous Government the sustainable transport criteria included only walkers and cyclists, leaving out other forms of vulnerable road users such as horse riders who were classified as recreational. This has meant that sec 106 developer contributions for transport could only be used for cycling and walking. In fact by default horse riders are not totally disadvantaged because they had generously agreed to include cyclists in the use of bridleways under the Countryside Act 1968. That was well before the evolution of mountain bikes. However there are many situations where horse riders need improvements to the bridleway network for their own sake and whereas walkers have 100% use on all available rights of way as well as 'open access' on mountain, moorland, heath and down, the use of cycle ways is often not reciprocal with use by horse riders. Equestrians therefore have no readily available funding streams to address their individual needs. As far as I am aware not one bridleway has been created under the terms of the CROW Act 2000. In order to address this inequality surely the point should be made that it should not matter what the purpose is for walking, cycling or horse riding, they should all be treated equally, because whether it be recreation or transport, those partaking are not otherwise engaged in driving a motor vehicle. They are all vulnerable when in close proximity to faster moving motorised vehicles which has disenfranchised many horse riders in rural areas and I suggest inhibits walking and cycling also. If this were not the case then the cyclists would not be so keen to incorporate so many bridleways into national cycle routes. 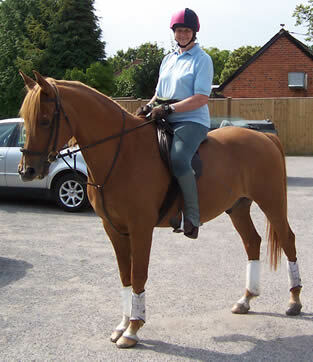 It would help therefore if horse riders were included in the generic term of sustainable transport to enable them to address their individual needs and also to join up the fragmented bridleway network or create bridleways where the road conditions inhibit their use but may not cause such a problem to other non-motorised users. "I do hope you can help." He has also written to Jeremy Hunt , MP for South West Surrey and Anne Milton, MP for Guildford making the same point. "I hope you too will press for something to be done to make all NMUs equal whether on forestry commission land, roads [Highway Agency and TROs] National Parks and open access land," he told them. Why dont you also write to your MP ? Send us a copy of your letter and the reply - If you get one.